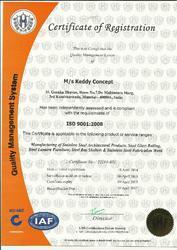 Established in the year 2007, we Keddy Concept are one of the prominent manufacturers, traders, exporters and suppliers of a wide range of Stainless Steel Railings, Stainless Steel Canteen Table, Crowd Control Barrier, Fabrication Trolley and Flanges. Our entire product range is highly appreciated for durability, anti-corrosive nature and perfect finish. Being of flawless quality, yet reasonably priced, our range of products is extensively used in steel, chemical, automobile, sugar, chemical, paper and allied industries. Manufactured using stainless steel, these products are in compliance with ASTM, DIN, BS & ASME standards. We capitalize on our state-of-the-art production facility that is equipped with sophisticated, advanced manufacturing facilities and technology to fabricate best quality products. The expertise & industrial exposure of our team members facilitates accurate and flawless production. Numerous tests are also conducted like pneumatic/gas test, pressure cycle test, temperature test and others to ensure that defect free products are supplied to clients. Moreover, we also undertake research work in order to upgrade our manufacturing technology and enhance the quality of our products. We offer customized steel products in various sizes, shapes and surface finishes to meet all the expectations and requirements of our clients. Manufacturing and Trading of pipe, plate, sheets, flanges, steel pipes, dairy fittings and buttweld fittings. Established in the year 2007, we, "Keddy Concept" are one of the prominent manufacturers, exporters and suppliers of a wide range of Metal Stairs, Stainless Steel Staircase Railings, Stainless Steel Railings, Stainless Steel Furniture, Tree Guards, Balusters, Stainless Steel Kitchen Furniture. The entire product range is highly appreciated for durability, anti corrosive nature and perfect finish. Being flawless in quality and reasonably priced, these products find extensive usage in Residential and Commercial Infrastructure sectors. Further, their manufacturing using stainless steel of ASTM, DIN, BS & ASME grades also ensure these bear flawless finish and durability standards. We have earned a huge client base that is completely satisfied with our range of pipe, plate, sheets, flanges, steel pipes, dairy fittings and buttweld fittings. Our entire product range is manufactured under quality oriented production process, hence, is of assured quality and yet competitively priced. We are backed by a team of highly qualified and competent professionals, which holds rich industry exposure and expertise in the concerned domain. These professionals are the essential strength of our company and each one of them strives to meet the needs of our clients at very reasonable prices. We conduct training sessions and organize workshops to make our workforce well conversant with the functioning of latest machines and equipment.